It’s no stretch to say that PC power users aren’t united in their praise of Windows 8. The operating system’s modern-style Start screen and its focus on touch-friendly apps has ruffled quite a few feathers among users who just want their old desktops back. But if you own a home-theater PC, you might want to put the hate on hold. Although Microsoft clearly had tablets and touchscreens in mind when it designed Windows 8, the new look and new apps actually translate well to television screens. Windows 8’s modern side provides an almost console-like experience, offering quick access to video apps and a look that’s a lot prettier than an icon-laden desktop. I’ve been using Windows 8 on my three year-old HTPC, a Lenovo IdeaCentre Q150, for about six months. The update has breathed new life into the machine, especially for streaming video and music. Although I still lean on the desktop for certain things, the modern side of Windows 8 has turned out to be a useful supplement. Windows 8's Start screen works great on a HTPC. When it comes to design, touchscreens and televisions have a lot in common. On a tablet, you want big, touchable buttons, so you don’t have to worry about pinpoint fingertip precision. Likewise, oversize screen elements are a natural fit for televisions. They’re easier to click if you’re using an air mouse or a multimedia remote, and they’re also easier to see from far away. Windows 8’s weaknesses on laptops and desktops become strengths on a home-theater PC. On a television, you don’t really need the old pop-up Start menu, with its hierarchy of programs and folders. The modern Start screen is an improvement, spreading out all your favorite media apps in a single view. The Windows button on your keyboard becomes a powerful shortcut as well, getting you back to your apps at any time. The fact that modern-style apps run full-screen instead of windowed is yet another benefit on HTPCs; the environment is more immersive when you’re choosing a video or listening to music. The DPI-scaling options in the upcoming Windows 8.1 update make using the desktop on a TV screen a lot easier. Big icons, yum. That’s not to say Windows 8’s interface is a perfect fit on TV screens. Although most on-screen elements are easy enough to see from afar, the app names on the Start screen are tiny, and the text doesn’t seem to respond to screen scaling in Windows settings. Also, unless you have a multitouch touchpad or a mouse wheel handy, you have no way to scroll in Windows 8 apps without using the scrollbar at the bottom edge of the screen. Strangely, the Start screen doesn’t have this problem—when you move your cursor beyond the edge of the screen, the menu scrolls along with it—but individual apps don’t allow you to scroll using only the cursor. One last interface nitpick: It would be nice if Microsoft allowed you to use an Xbox 360 controller to navigate through the Windows 8 Start menu and apps. This feature would be particularly useful for HTPCs with gaming muscle, as you wouldn’t have to rely solely on a front end such as Steam’s Big Picture mode to move from one game to another. The interface of Netflix's Windows 8 app (and virtually all other modern apps) is well suited to TV screens. Let’s get this out of the way: The app selection in Windows 8 doesn’t stack up to that of other platforms. The Windows Store is missing a fair number of notable video apps, including Amazon Instant Video, HBO Go, and Vudu, and MLB.tv is pitiful on Windows 8 when compared with its iOS and Android counterparts. Several notable big-name services are missing on the music side, too. For movies and TV shows, Windows 8 has apps for ABC Player, Hulu Plus, Netflix, and Crackle (a great way to catch up on Comedians in Cars Getting Coffee). If Web video is your thing, you’ll find apps for CollegeHumor, DailyMotion, TED, and Vimeo. Although YouTube doesn’t have an official app, TubeTV for YouTube is an excellent unofficial alternative for televisions, as it’s designed to let users lean back and watch a steady stream of videos. You can also find more esoteric options such as FilmOn, which provides live, streaming television shows through legally questionable methods. 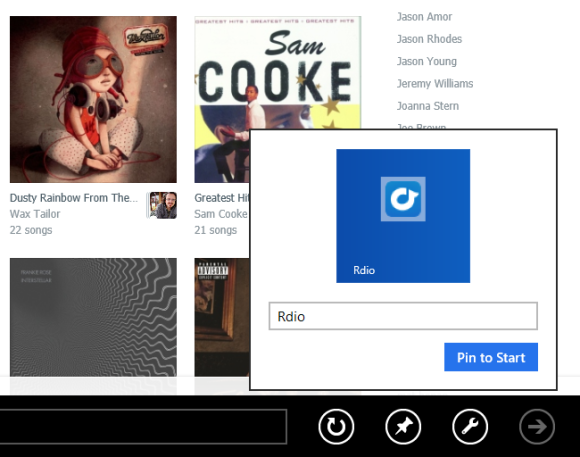 Pinning the Rdio website to the Start screen in Internet Explorer 10. Speaking of which, if you use your HTPC for music, Windows 8 has a solid selection of streaming audio apps to choose from. Vevo is a great source for streaming music videos, and SlapDash has you covered for podcasts—both video and audio. You can get your Internet radio fix from iHeartRadio, Slacker, Songza, and TuneIn, and if you absolutely must listen to Pandora, you can use an unofficial app called MetroRadio. Although Spotify is absent from the Windows Store, the built-in Xbox Music app will let you listen to 10 hours of on-demand streaming music for free every month. Granted, you don’t need Windows 8 to access most of these streaming services, given that most are available through any Web browser, and virtually all offer desktop programs—programs that work just fine in Windows 8’s desktop mode. Desktop programs on a Windows 8 HTPC work just the same as they would on a Windows 7 HTPC. But native Windows 8 apps are quicker to access and easier to navigate, and they automatically open in full-screen mode. It’s nice to be able to turn on your computer and start playing a Netflix video in just a couple of clicks. Windows Media Center isn't included with Windows 8. By now, you’re either totally on board with upgrading your HTPC to Windows 8, or further galvanized in your loathing of all things modern UI. If you’re leaning toward the former, you still have one big drawback to consider: Windows 8 does not include Windows Media Center, which once served as a TV-friendly hub for users’ own libraries of music, videos, and photos. The built-in Xbox Video app contains some of Windows Media Center’s functions, but it isn’t nearly as powerful. You can’t play a sequence of videos in a row, and you can’t install new codecs to expand the number of video formats it supports. Worst of all, Windows 8 doesn’t support native DVD playback, or live TV playback and recording through a TV tuner. WMC plays nice with TV tuners, but few third-party HTPC interfaces do. Given the hassle and the potential cost involved in restoring Windows Media Center functionality, Windows 8 isn’t worth the upgrade if your goal is to record live TV or watch DVDs with your rig. In fact, if you already own and appreciate a perfectly functional Windows 7 HTPC, you have no truly compelling reason to upgrade it to Windows 8 at all. Windows 8 even exceeds Windows 7 as a home-theater OS in some ways. Its superfast boot times are especially welcome in the living room, particularly if your computer packs a speedy solid-state drive. But more impressively, the OS really shines as an extra TV-friendly layer on top of the core video functions of an HTPC. With the number of apps that are available, it’s basically a way to tack on streaming set-top box features—similar to those of a Roku box or an Apple TV—without sacrificing the flexibility you get from a full-blown PC. In many respects, it’s the best of both worlds. The lack of WMC and native DVD playback support prevent Windows 8 from being a "no compromise" HTPC environment. All in all, however, the controversial modern interface translates startlingly well to the TV screen.